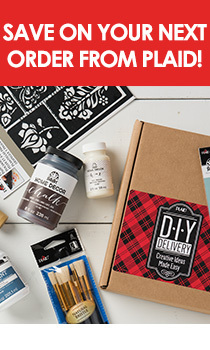 Learn General Crafts from the experts at Plaid! Introducing the EASIEST technique to get an incredible faux Barnwood and Rust finish using FolkArt Painted Finishes! Cathie & Steve explain how FolkArt Home Décor Chalk transforms your everyday items into one of a kind treasures! Easily brush on bold, vibrant color to wood and natural fibers with FolkArt Ultra Dye. In this quick video from Cathie and Steve, learn how to make ghosts using cheesecloth and Stiffy fabric stiffener from Plaid Enterprises. Learn how to craft with burlap, currently one of the hottest crafting and DIY trends. Learn about FolkArt Home Decor Texture Chalk, an easy way to give furniture and home decor accessories an old-world, vintage feel. Learn more about FolkArt Painted Finishes and create the 11 beautiful DIY home decor projects included in this free craft eBook! Learn more about FolkArt Glitterific by reading the FAQ. Frequently asked questions about FolkArt Extreme Glitter. Learn how to use FolkArt Painted Finishes Barnwood to create the illusion of aged, rustic barn wood.